3-7-night minimum stay requirement varies by time of year~ Wake up to this idyllic view over the oasis pool out to the Atlantic Ocean...close your eyes and just breathe.... whether searching for a peaceful romantic getaway or an adventure vacation for the whole family, this 3-bedroom, 3-bath, tri-level townhouse suits the occasion. Plush leather living room furnishings offer relaxed comfort for gathering the family to watch a movie on the 50' TV or pull up a chair at the game table for a rousing game of checkers or cards...when did you last enjoy just some one-on-one time with your family or friends? On the top level is the master bedroom with a king bed and a screened patio that provides a peaceful escape for some quiet meditation and a breathtaking...serene...ocean view. The luxurious ensuite's jewel is the sunken jetted spa tub and also offers a separate glass shower. A guest bedroom also on the third level has a king bed with a full ensuite. The third bedroom resides on the second floor with a comfy, queen-size murphy bed. Additional sleeping is accommodated by a sleeper sofa in the living room. The custom designed kitchen with strikingly beautiful granite counters, wood cabinetry and stainless appliances allows the cook in the family to easily mingle and remain a part of the gathering. Key Largo’s prevailing winds allow comfortable outside living on the second floor screened terrace or take the spiral staircase down to the oasis poolside for a lazy sunning afternoon. 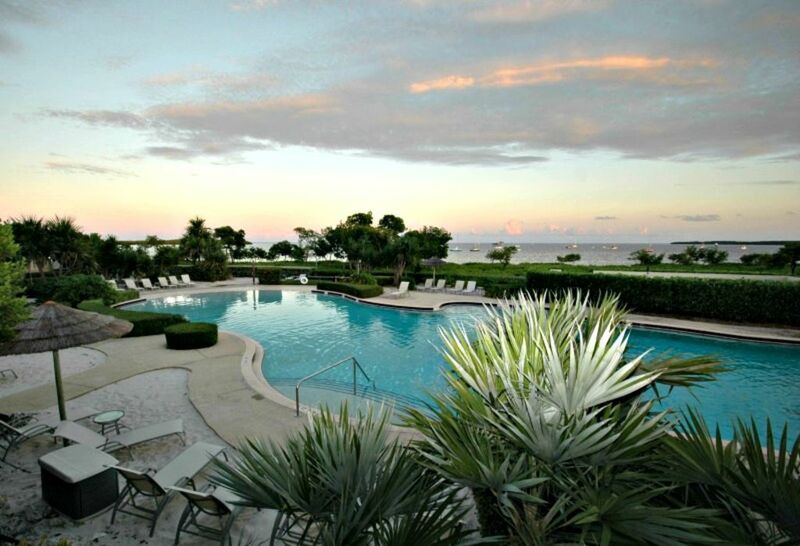 Mariners Club is an oceanfront gated community with an onsite, upland sunning beach. Sorry, no wade in access to the ocean. This townhouse has a pool and oceanview! 6 at dining table and game table for 2 offers additional seating. 50' LCD in livingroom, TV is master bedroom and 3rd floor guest bedroom. 2nd floor has small TV for gaming. Dockage available for an additional fee...email the harbormaster at info@MarinersClubMarina.com be sure to give them the size of your boat and your dates for rates and availability. Lovely property, good location, easy to access. Could use a few more basics like cooking spray, toilet paper, and beach towels would be nice. We are very happy to know you enjoyed your stay! Beach towels are coming soon! We really enjoyed our stay here! Plenty of elbow room for six adults. Kitchen was well equipped for basic food prep. Parking for two vehicles. The neighborhood is very well kept with good security. Beach views are great but there's really no beach access here (not a problem for me but may be a dealbreaker for others). Overall a great vacation spot! Thank you for your review of 405 Mariners Club, Susan! Please come back again! Pool was beautiful - didn’t know the second pool and the grotto hot tub were under construction. For three couples this was the largest three bedrooms to rent that we could find - two with king beds was fine- however the Murphy queen size bed was just ok for the three nights. Suits two couples better. Fishing tournament was on and it was fascinating to watch some of the Jimmy Johnson tournament competitors ready their boats and bait. The property is nicely maintained, furnishings were quite comfortable. Little things like a cutting board was missing and when we checked out, Barefeet rentals said they would have delivered one. There were only 4 placemats for 6 people and the website advertises for up to 8. If something isn’t quite right at least call the rental company right away. We really enjoyed making our own breakfasts and lunches at home and sitting on the screened balcony overlooking the pool with lots of palm trees and greenery near the balcony. Lots of good fish restaurants for dinner and we tried key lime pie everyplace we went. Driving in the keys is risky when it is busy as there are many U turns and the majority of people do not signal - so be careful on the highway. Our mission was to be in Key Largo and go snorkeling and we finally had a good weather day. It is a good place to stay! We are very happy you enjoyed your stay at Mariners Club townhouse 405, Joan! Thank you for reminding future guests that a quick call to the office or guest services and they'll be taken care of! Please keep Barefeet Vacation Rentals in mind for your return trip! Really nice spot to relax on decks and just walk out to pool. Relaxing. Rooms were very nice. Everything was clean and functioning. Awesome restaurants on bay side to enjoy sunsets and seafood. Thank you for taking the time to leave us such a nice review! We hope to see you again! The grounds are well kept, there is a big pool, 24 hour security, and a clubhouse. Our unit was in good shape with a full kitchen. The main level and master bedroom both had screened porches looking over the pool and on the bay beyond. This building and two others had the best location. Other buildings may look at dense mangroves only, so read carefully. 405 was ideal for proximity to the pool and a great view. There were plenty of towels and kitchen equipment. Three beds, one a Murphy bed. The unit began on the second floor and went up to third floor, so you climb two sets of stairs to the master. Thank you for your feedback, Frank, and the 5-star review! Great house. Location is stunning. The pool is perfect. Great for families to stay. Only criticism is that the house is barebones. You get minimal supplies. Would be nice to have a few things there basics like 1 or 2 pool towels or a little extra toilet paper etc. we had to buy salt and pepper. Silly stuff like that. But that’s more my particular pet peeve. Even with that we would stay here again (and plan too next winter). Opportunities to fish our back country or deep sea abound. Water sport activities are plentiful and for the nature lovers, there is kayaking, swimming with the dolphins, air boat rides and everglades tours. Or, just relax with a tropical beverage and do nothing at all but watch our beautiful sunsets! Our monthly rates are based on a 28-night stay so will not calculate correctly on VRBO. Please call us for an exact rate quote if your stay is a month or longer. 3-7 night minimum stay requirement varies by time of year. No arrivals on Christmas day.